After eating a plate full of shrimp and grits mixed with sausage/egg casserole I decided to go in search of some more local history. I queried several family members to see if they would be interested in trying to find the grave of the Allman Brothers Band co-founder Duane Allman. The mission took on added importance when several folks said “Yes!” I recalled a family reunion several years before when the same search yielded zero results, so the pressure was on for me to find the right location. The five of us headed off in three cars and after several wrong turns on the narrow cemetery road network I came upon my nephew’s parked car. I looked downhill toward the Ocmulgee River and saw my nephew, Roddey Jones, waving with his father, Harry. Roddey had found the grave without the wrong turns brought on by my age. Moments later all five of us walked up the red brick steps to the fenced off grave of twenty-four-year-old Duane Allman. 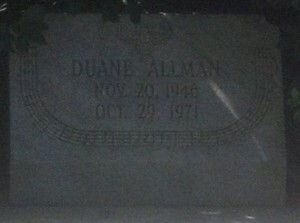 But there was another grave next to Duane. 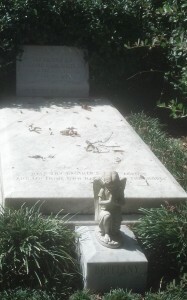 The name etched into the white marble headstone read “Raymond Berry Oakley III”. I vaguely remembered that a second member of the Allman Brothers Band had, like Duane, also died in a motorcycle wreck. Well, twenty-three-year-old band co-founder Berry Oakley lay next to his good friend – the bassist still strummin’ next to his lead guitarist. Remarkable how two such gifted musicians perished in separate motorcycle wrecks just over a year apart in 1971 and 1972 only mere blocks from each other in Macon. All five of us continued to look through the fence at the two graves, thankful for the God-given musical talent of Berry Oakley and Duane Allman. Two small angels guarded the foot of each grave. We all wondered about that because the name “Galadrielle” was etched on the angel below Duane’s grave and “Brittany” etched on Berry’s angel. I have since discovered these are the names of their kids. After more reflection we moved back toward our cars. Larry and Katie Moffett noted that they had seen the Clisby family gravesite when we had turned onto Carnation Ridge so I joined them while Harry and Roddey headed back to the hotel. Moments later we looked over the tall obelisk for the Clisby family. Celetta Ransom Clisby had married Joseph Clisby, owner and editor of the Macon Telegraph in the mid-1850s. My mother-in-law is named Celetta Randolph Jones and the Macon Celetta was her grandmother. I was reminded that trying to keep track of the Powell, Jones and Clisby families in Georgia requires a map-like family tree. A short time later, we returned to our cars and headed toward the cemetery exit. However, the sight of the Second National Confederate flag flying high above the trees at the end of Carnation Ridge gnawed on me. Due to time I decided not to head in that direction figuring that I could return to the cemetery on another visit to Macon. After having a brief mental wrestling match with myself, I pulled the car over and began to walk back downhill toward the flag. 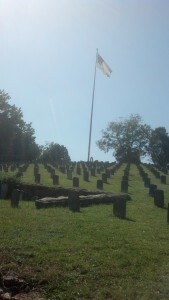 The flag snapped overhead in the breeze as it stood sentinel over the graves of 602 Confederate soldiers. The names and units etched on the markers showed that some of these soldiers had served in the state militia which meant that many of them had enlisted as young teenagers, barely able to shave, or else they had signed up as old men with grizzled gray beards. I walked amongst the numerous headstones of these citizen-soldiers who fell nearly 150 years ago and then headed back uphill past the wind-whipped flag toward my car. On this beautiful cloudless fall day, I remembered being thankful to God for the history of our Confederate soldiers, our music and the Georgia family that welcomed this Virginian into their fold.